Boil 4 cups water, add rotini and cook for 9-11 minutes. Drain. In bowl mix salmon (drained, skin and bone removed), alfredo sauce, rotini, onion, garlic and let cool. Place a bed of spinach in a serving bowl and add the salmon mixture and green olives on top. 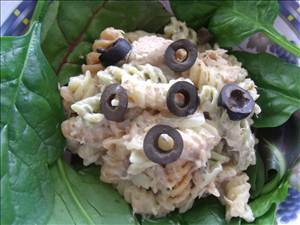 There are 473 calories in 1 serving of Salmon Alfredo Salad. Calorie break-down: 39% fat, 43% carbs, 18% protein.